Webpage for the Martime Management Plan, a collaborative project to gather information about water access facilities and the needs and desires of the community to improve these facilities. The project team consists of researchers from the Northeast Florida Regional Council, Univeristy of North Florida, and Jacksonville University. Interactive website for the Maritime Management Plan, consisting of maps on ecological resources, existing boat facilities, navigable waters, etc. Short video on the Heritage River Gateway project - a vision of future water developments in Jacksonville. Map of existing and future Southbank Riverwalk improvements, water taxi docks, and the multi-use path that will connect the loops. Explore places of interest with this 2016 aerial map of Duval County. To access the map click on Duval Property in the navigation pane, then choose "Duval Aerial 2016" from the gallery of Basemaps. Website for detailed information on boating and fishing in Nassau and Duval Counties. Please see meeting documents below for additional detailed maps and vision plans for all areas of Jacksonville. The St. Johns Riverkeeper is an independent, privately funded organization that defends, advocates, and activates others to protect and restore the St. Johns River. City Commission established to make recommendations regarding the improvement, development and protection of the St. Johns River and all tidal waters in Duval County. City Department dedicated to serving residents and visiters of Jacksonville through recreation activities and conservation of marine resources. Groundwork Jacksonville is the City's main non-profit dedicated to cleaning and redeveloping Hogans Creek and converting contaminated land into parks. The organization represents a partnership between the City of Jacksonville, US National Park Service, Environmental Protection Agency, and Groundwork USA. Jacksonville University research institute focused on studying the St. Johns River, waterways, and oceanfront with the goal of protecting and preserving these natural resources. The UNF Environmental Center is involved with ongoing research focused on the St. Johns River, as well as, educating students about the river though experiential learning. Organization dedicated to tree planting in the Jacksonville area. Non-profit organization working to restore, improve and protect the quality of the environment through programs in the fields of horticulture, conservation, civic improvement, and education. Organization dedicated to infrastruture, sustainability, and emerging trends in the responsible use of land in North Florida. The Jacksonville Chapter of the American Institute of Architects advcoates for a healthy and sustainably built environment throughout Jacksonville and Northeast Florida. The DIA was created to revitalize Downtown Jacksonville and spur economic development. The DIA works with the City to offer incentives for businesses to locate Downtown. Non-profit organization geared towards building and maintaining a healthy and vibrant Downtown. The Jacksonville Zoo hosts river cruises of the Trout River every Saturday. The tours offer opportunities for bird watching and sightings of dolphins and manatees. Website for Jacksonville's Museum of Science & HIstory (MOSH). The MOSH hosts science and history boat tours of the St. Johns River every Saturday. Initiative to bring Florida's first floating naval warship museum to downtown Jacksonville. Water taxi and tour company running from Friendship Park on the Southbank to the Jacksonville Landing on the Northbank. Fun-filled way to tour the St. Johns River or avoid traffic during events downtown. Proposal to develop Mayport as a historic village and working waterfront. Continued proposal for the development of Mayport. Map of bicycle routes from north of the St. Johns River stretching to Hecksher Drive and Main Street. Map of proposed sustainable water lauches along the St. Johns River. Map of current and proposed trails along the Emerald Necklace. Proposed plan to develop pedestrian and bicycle paths in Hogan's Creek. Proposal to connect Brooklyn and Riverside Avenue via the St. John's River by widening McCoy's Creek. Priorities for water development in North Jacksonville. Map of key development locations in North Jacksonville. Plan to enhance water access in Southeast Jacksonville. Redevelopment priorities for the Tallyrand area. Map of Timucuan trail segments. Map of multi-use trails within Duval County. Transit map for Downtown including water taxi, skyway, trolley, etc. 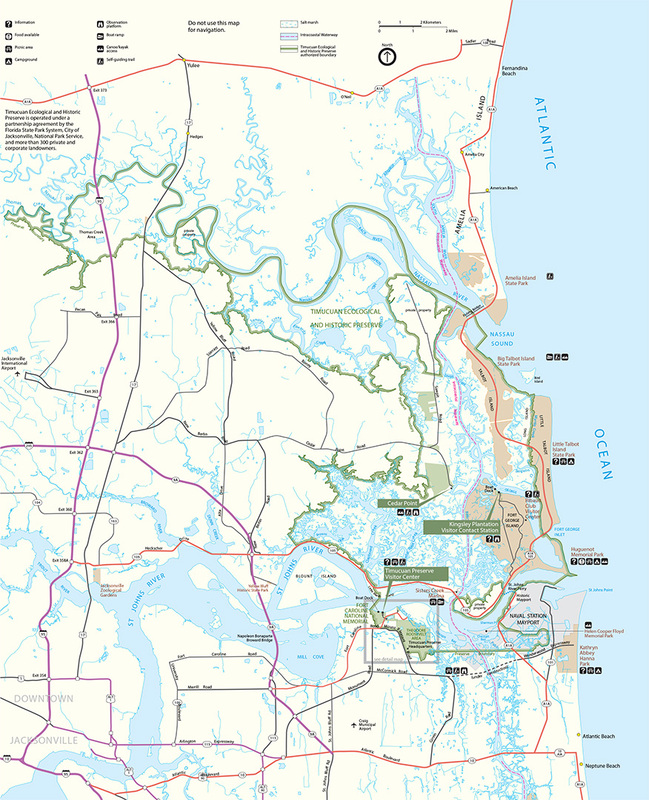 Detailed water access map for Duval County for motorized and non-motorized watercraft. Map of boat docking facilities located Downtown. Map of future Riverwalk developments on the Southbank.